Today I visited something that I have seen pictures of and copies of, in fact I have seen it play a part in a couple of weddings. 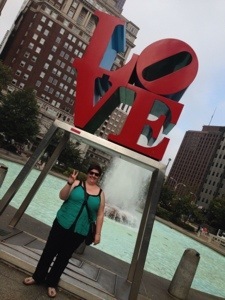 I visited the ‘Love’ sculpture by Robert Indiana in JFK Plaza in downtown Philadelphia and got to see it IRL (in real life). It was not what I was expecting. It is actually quite small, it is only about 2 metres tall and sits on a metal frame over 2 metres off the ground so you can’t touch it. I’m glad I went, but I was disappointed. I thought it would be bigger plus I didn’t realise that it is red and green. The front and back are red but the rest is green. This often isn’t clear in photos. It is funny how seeing things in real life can be a disappointment. Seeing hundreds of images of some thing or some where online does make it seem a little real. The real thing can feel not real enough when you actually see it. But I think it always worth seeing the real thing if you can. So here’s a picture of me and the real ‘Love’ sculpture.